Oregon&apos;s rivers are known for world-class white water rafting and fly fishing adventures. Countless waterways crisscross the county, cascading down mountain slopes as spectacular waterfalls, and filling numerous lakes and reservoirs. With so many rivers here, there is also an extraordinary concentration of preserved covered bridges. On the McKenzie River, thrill seekers charge its white water corridors; while in town local brewmasters credit the McKenzie&apos;s purity as an important factor in Eugene&apos;s phenomenal beer scene. With easy access from multiple riverfront parks, fish or float the beautiful Willamette River right in the heart of Eugene - Springfield! In Historic Old Town Florence take a river boat tour up the Siuslaw River, or out into the ocean for crabbing and fishing. 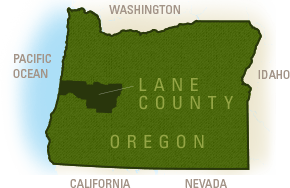 Other notable Eugene, Cascades & Coast waterways include Mohawk, Long Tom, Fall Creek, Little Fall Creek, Camp Creek, Horse Creek, Coyote Creek, Mosby Creek, Poodle Creek and Tenmile River. Local river guides offer a variety of year-round water tours by jet boat, drift boat, raft or kayak. Check the current water levels for Oregon&apos;s rivers.